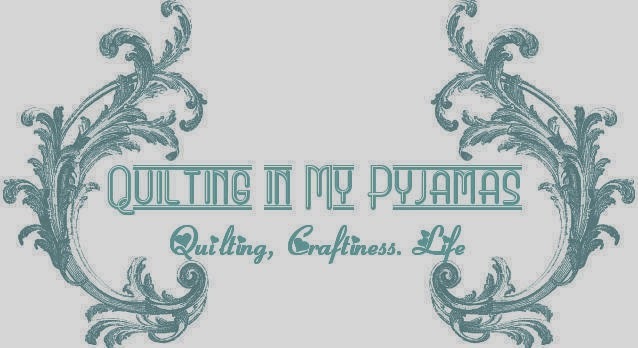 I hesitated to enter this as my second quilt in the Bloggers Quilt Festival. I didn't enter it last time around because it felt a little bit like cheating because I didn't do the whole thing myself. Then I suddenly realised that lots of people don't quilt their own quilts , they send them out to be done professionally and that my Mrs. DeWitt Quilt is just a variation on that theme. Mrs. DeWitt did all this beautiful and time consuming hand piecing and the universe sent it to me to be finished. So if it wasn't for both myself and Fontella doing our bits this quilt would never have come to be a finished thing and I like the idea of having made a collaborative quilt with her , even if it was decades after she finished the top. All of this started because once upon a time I decided it would be a good idea to rescue a vintage or antique quilt top that needed some love to bring it back to it's former glory. After many months of searching I found an unfinished vintage Martha Washington Flower Garden quilt top that I fell in love with and had it shipped 10,000 miles across the world, holding my breath almost the whole time lest it not be as lovely as the picture I bought it from had showed. This quilt was started in the 1930's or 1940's by a lady named Fontella Holmes DeWitt in Iowa. Mrs. DeWitt was born in 1905 in Winterset, Iowa and passed away on Christmas Day 1985. I'm assuming that this quilt lurked around in an attic somewhere for the next 30 odd years while someone thought about finishing it. It was in pristine condition so it had been stored very carefully for all those years. 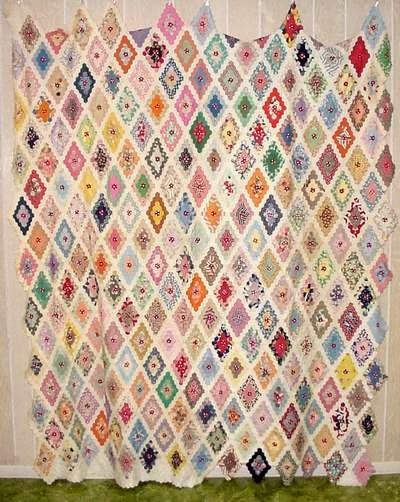 Her hand work on this quilt is absolutely exquisite and she was obviously very skilled at paper piecing. I wondered why she didn't finish this and the only thing I could come up with was that she got totally fed up with hand sewing hexagons. By my reckoning there are about 8000 of them in this quilt. The plan was to finish the white borders on the edges ( never mind that at that point I had no idea how to paper piece hexies) and then turn this into a useable work of art. This was a huge quilt at almost 80 by 90 inches and I had visions of me hand sewing minute little one inch hexagons like some pioneer woman and actually being serene and happy about it. It lobbed at Maison Pyjamas via the grace of USPS and Australia Post. It was gorgeous. It was perfectly square. The hand sewing of all those teeny tiny hexies was perfect. Angels sang and trumpets heralded it's arrival. And then I hung it in a cupboard and there it stayed for 4 or 5 years while I contemplated trying to find cream fabric to match, and the agony of hand sewing 400-500 teeny tiny hexies to finish it off. Occasionally I'd take it out and stroke it lovingly and reassure that poor unfinished top that one day it would be a finished functioning quilt and that we'd be together forever. Sometimes inspiration hits you like a bolt of lightning. While I was off work on vacation earlier this year, I pulled that quilt top out for it's annual foray into actual light and out of nowhere I decided the time was right to finish it. The sticking point was whether I was going to hand piece more hexagons or come up with another plan. I consulted with QuiltyGal at lunch that very day and decided to go for it. I laid it out and basted it with about 500 pins. I used a wool batting with a higher loft than I usually use and I really enjoyed working with it. It was almost as if the hand of Mrs. DeWitt was helping me along wanting me to finish her wonderful unfinished work of art. And as I worked and got to see all the fabrics in detail I weaved wonderful stories in my head about where they had all come from and what they had been used for before. That fabric there had come from a Summer Dress, and that one from a weekday working skirt. I could see her Sunday best outfit and fabrics from her babies clothes all dancing through my head and as if I could see the life that Mrs. DeWitt had lived through her fabrics. I started quilting using a serpentine stitch because I didn't want to detract from any of Fontella's beautiful work. Sometimes simple is best. It took 5 spools of bobbin thread to get through this baby, because I quilted it very very closely together with a serpentine stitch. I have to say there were points where this was not fun to get it all through my machine. And the whole time I was terrified that I was going to do something to mess it up! Then oh horror of horrors I squared the quilt up and cut all those pretty unfinished points off to bring this quilt down to 70 x 80 inches square. If I hadn't sacrificed those points it would have sat in the cupboard for another 30 years unfinished. Sometimes you have to make the tough calls. I picked a plain fabric that was as close as I could get to the original cream hexagons for the binding, in keeping with the original colour scheme of the quilt. And finally I put the last stitch in and she was finished, approximately 70 years after she was started. I'd venture a guess that this was one of the worlds oldest WIP's. And I was seriously thrilled. More gratuitous fabric shots. Aren't they pretty? And the back ...I love how this looks! I'm so happy with this finish. I'm prouder of this than anything else I've ever made. I like to think that somewhere Mrs. De Witt knows that her beautiful work is finally being used the way she hoped it would be all those years ago. Yes- I use this quilt a lot. And it was a no brainer to name this quilt in her honour. I'm entering this quilt in the scrappy category because it has several hundred different fabrics in it and I don't think it gets much scrappier than that. Thanks for dropping by and having a look at my post. And if you know the Holmes - DeWitt family please tell them their Mom's quilt is in good hands, a lot further away from Iowa than they ever imagined. I'm so happy to see this beautiful quilt again!! I think the solution to get it finished was brilliant.Did you ever do something with the hexie cut offs? It's definitely scrappy in the most wonderful way! A delightful story with a very happy ending. Your quilting is perfect for this quilt - looking great on both the front and back. Wow, Shay, what a treasure! I think you chose exactly the right quilting design. I know Mrs. Dewitt is smiling. What a collaboration! So glad you shared this quilt's story! It is a real quilt now, as it was always destined to be! A good lesson that a plain back shows off quilting beautifully :). Beautiful story, beautiful quilt! I am so happy you finished this quilt for you to enjoy and for sharing the journey. The quilting is perfect for it. Beautiful quilt and a wonderful story to boot. I'm glad you shared it. She's hosting a lutefisk supper at her church next weekend (800 peeps arrive to eat that stuff) but will be chatting with her soon. A great save any way you look at it. You did a beautiful job. Perfect choice for entry #2, you both did a grand job! I am a sucker for hexagons so this quilt really appeals to me! You've done a great job and I wish you good luck! Such a fantastic job!!!! Well done on the finish!!! Oh wow, Shay, I got goosebumps reading that and thinking about all the history there. That's amazing. Such a pretty quilt - Shay and Mrs DeWitt make a great duo. Your efforts saved hers. It's also a great story. Let your descendants know - they should keep the quilt in the family. Don't wash it - ever! Mrs. DeWitt and you did a bang up job of this quilt. It waited in storage for the perfect person to finish it. Such a fabulous quilt and interesting story. I do hope the wool batting was not the same as the one that shrank in the dryer!! I love the story and the finished quilt looks amazing. Lucky if found someone to love and cherish it! I love that you took the time to find this quilt top from the other side of the world and finish it for posterity. You did a great job in finishing it off and I can well imagine the stress involved in making the decision to cut off those points. Did you keep them? Perhaps appliqueing them onto a cushion to go with the quilt might be a way to use them if you did. So great to also have the information about the original maker. Amazing finish. So much time put into this...glad it's finished and can now be cherished!!! GOod job! Brilliant story, a true labour of love, well done. Laughing out loud at your bio, going to have to follow your blog now, am a bit of an Aussiephile if there is such a thing. Every quilt has a story and this one was just wonderful! Thank you for rescuing this quilt from oblivion and giving it a new life and a chance to fulfil every quilt's ultimate purpose --- to bring comfort and joy to someone's life!